As we all know by now, NBA superstar free agent LeBron James chose to "take his talents to South Beach" and play with the Miami Heat. This decision takes him to a team termed as Dwyane Wade's team, and now also occupied by Chris Bosh. Will this be good for Miami or a nightmare? Of course, a couple big stars on a team is usually a recipe for a championship dynasty (Chicago Bulls in the 90s, Lakers and Celtics in the 80s), but will these 3 mega stars be able to get it done with the amount of shine they each already have? As much as big stars win championships, they also often do not when sharing and teamwork are clouded by egos. What do you think? 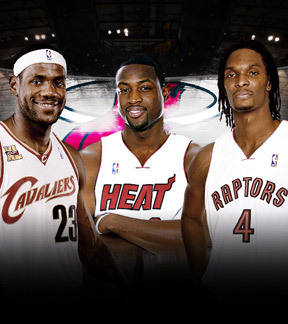 Will the Heat be champs in 2011 or 2012 (with a year to get used to each other)? Or will this be the biggest disaster in NBA free agent history? Obviously the City of Cleveland is extremely upset by this decision and know their economy will see some suffering. See this stern letter from the team's owner! Also, LeBron James has found a new family member. His alleged father has emerged on the scene and is making as much of a stir as his superstar son! Check the info here. Weigh in folks, what do you think!?!?! If the decision that LeBron James made, ultimately makes him the happiest then I believe it was the right decision for him to make. However, like many others, and being a Chicagoan, I would have liked to see LeBron bring his talents to the Chicago Bulls. With the addition of veteran Carlos Boozer, and young stars like Joakim Noah (100% heart and hustle-man) and Derek Rose (one of the best point guards in the league at only the age of 21) and LeBron James the Bulls would have been a serious, championship contender for years to come. Obviously, James did not feel this way. Also, like you said, LeBron is now going to Dwayne Wade's team. I mean, how is that going to work out? I think it could spell disaster. You now have 3 superstars that are used to the spotlight, now they must learn to share that spotlight. Let's see how they adjust. Many believe this means automatic championship down in South Beach; well I disagree. Now management has another huge task ahead of them; they must surround these 3 superstars with the right pieces to make it all work, which is going to be a little bit difficult considering they have little cap space. They are going to have to sign players with minimum contracts. 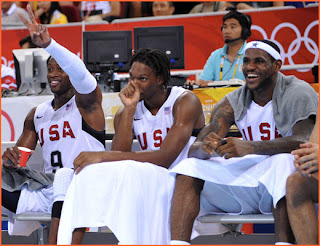 Also, Dwayne, LeBron, and Chris are going to have to have the right chemistry on the court to be successful. This is going to be truly interesting to see how it all unfolds. Like everyone else, I can't wait to see all three of these superstars on the court together and see if these moves by the 3 will truly create a dynasty! LOL, we will have to discuss Leicester at another time because that is totally different story.